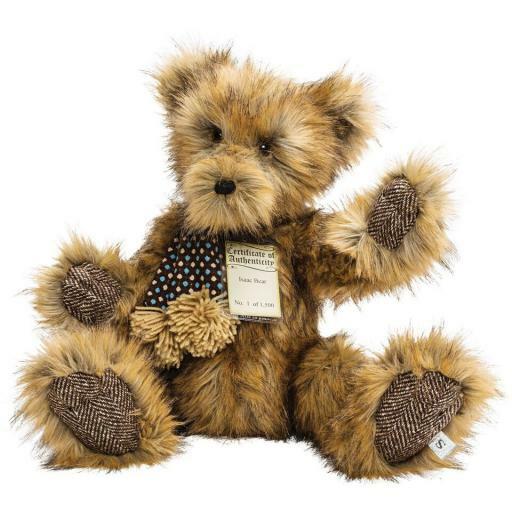 Another Sidmouth Gifts favourite, we think Isaac is a very chatty collectible bear! He likes to sit in the window and command attention. Lovaeable Isaac is a combination of brown tones, with delicate darker highlights. He has a long unshaven muzzle, finished with a dark brown nose. Issac's pads are made of brown tweed, and he has stitched fingers and toes. He is wearing a pom-pom finished scarf decorated with light blue and beige dots. As with all the Silver Tag bears, Isaac is fully jointed, substantially weighted, and has a classic hump. Isaac comes with an individually numbered Certificate of Authenticity. He is 63 cm standing. Isaac is one of 1500. He can be spot cleaned.